﻿ Cape Town Beachfront Apartments at Leisure Bay Cape Town. JIMAT di Agoda.com! Ada soalan mengenai Cape Town Beachfront Apartments at Leisure Bay? Terletak di tengah-tengah Milnerton, Cape Town Beachfront Apartments at Leisure Bay merupakan tempat yang sesuai untuk meneroka Cape Town. Keseronokan pusat bandar hanya sejauh 18 km sahaja. Penginapan ini berada di sekitar kawasan tarikan bandar yang popular seperti Persimpangan Ratanga, Padang Golf Milnerton, Muzium Tentera Udara SA. Ambil kesempatan daripada pelbagai perkhidmatan dan kemudahan yang tiada tandingan di hotel Cape Town. Hotel ini menawarkan pelbagai kemudahan di lokasi untuk memuaskan hati tetamu termasuk yang arif. 27 bilik di sepanjang 2 tingkat menyediakan suasana nyaman dan menyenangkan. televisyen skrin rata, linen, cermin, sofa, tuala boleh didapati di beberapa bilik. Di samping itu, pihak hotel menawarkan aktiviti rekreasi untuk memastikan anda mempunyai perkara untuk dilakukan sepanjang penginapan anda. Cape Town Beachfront Apartments at Leisure Bay adalah destinasi sehenti anda bagi penginapan hotel berkualiti di Cape Town. Deposit keselamatan kad kredit sebanyak ZAR 500 diperlukan semasa mendaftar masuk untuk caj atau kerosakan semasa menginap dan akan dipulangkan apabila mendaftar keluar. Sarapan disediakan atas permintaan. Sila hubungi pihak penginapan untuk membuat tempahan. Thank you for completing a Guest Questionnaire after your recent stay with us. We rely on guest feedback to determine both the positive and negative aspects of our property and to improve wherever possible. Your interest and concern are therefore extremely valuable to us, and we hope that you will be staying with us again soon. We should welcome another opportunity to show you our hospitality at its best! amazing views. peaceful atmosphere. perfect for walks on the beach. staff checking up on us was a bit irritating and intrusive. supermarket and public transport within close proximity (<1km). had to pay for parking as well as wifi which was a big letdown. Good day Aysha We appreciate you taking the time to give us some feedback after your stay. Apologies for the fact the you feel that the staff checking up on you was intrusive. The staff are trained to make sure that guests are taken care off and made feel comfortable at all times! We do have additional charges ie parking, WiFi and a refundable breakage fee and key-tag deposit that we collect upon arrival. This you will find under the guests policies section on the site whilst making the booking. We hope to welcome you back in the future......take care! Apartment itself was nice but you have to have a car. It is just too far from the Waterfront to walk. There were small maintenance issues that needed attention and although the staff were willing to help their knowledge was limited. Overall it is a pleasant apartment and I would go there again. Really enjoyed our stay and found this to be good value for money. We had a wonderful time and the view is spectacular! 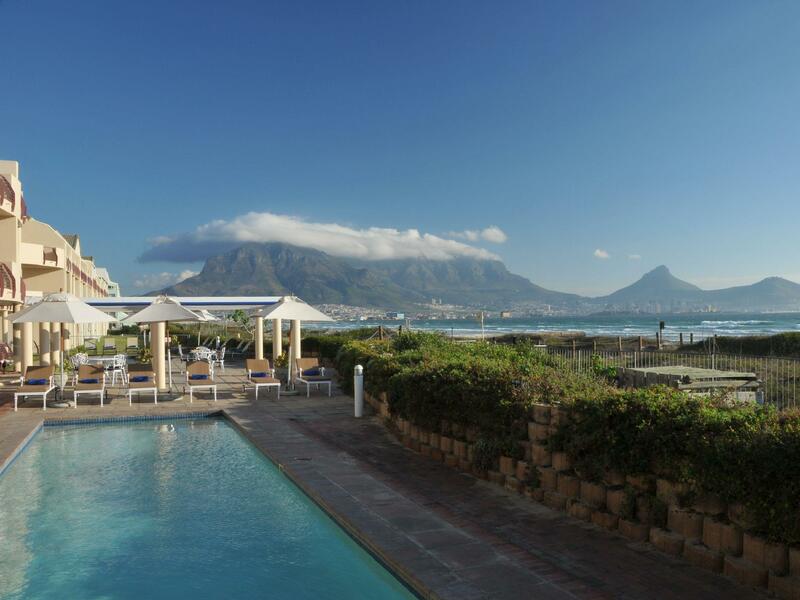 I liked this hotel very much because of the location right on the beach and the room was very comfortable.the swimmimming poll was great and the views back into cape town were fantastic.great price too. when we left at 4:00Pm. nobody look at us. also promised us to send invoice. but we never get it. Pleasure stay in this apartment. Friendly staff. Good security. The wifi is a bit hectic. Shower water is not strong enough. Tried to cancel one night from our booking but not successful. Well...overall, not bad. It was great, enjoyed the upgraded room and the view of the ocean was fantastic. we had an enjoyable stay . you have great views of the mountain with access to beach. friendly helpful staff . we visited in the winter but apartment had good heating which we occasionally used. we did not eat in the Hotel restaurant but others found food decent. We had a fantastic time at Leisure Bay Luxury Suites. The view was to die for (Sea and mountain view from main bedroom and living area and balconies) and the friendly staff, made our stay an absolute pleasure. Can not wait to go back. A definite MUST in future. Our stay here was pleasant. The rooms are clean and comfortable with great views(if you request ocean facing), and we were upgraded to a 2 bedroom apartment for free. The staff are friendly and attentive, and nothing is too much trouble for them. However, if it's something that bothers you, the hotel is starting to show its age and the food is plenty but quality isn't great. Very friendly staff. Superb views and very good value for money. Location is close to City, Waterfront, Beaches and Century City.